Tiger Woods returned to winning ways yesterday, just 3 tournaments since knee surgery last year. 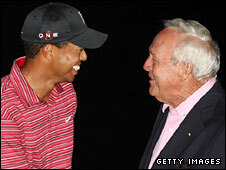 Beginning the day 5 shots behind Sean O’Hair, Woods fought back in true Tiger style at the Arnold Palmer Invitational. fourth. Further birdies at seven and eighteen sealed victory by one shot. “It feels good,” he said afterwards. “It feels really good to be back in contention and feel the rush. It’s been a while. Asked about how his rivals cope with such a final-day charge, Woods added: “I’m trying to beat them just how they’re trying to beat me. It doesn’t change. “It’s just about being there and somehow timing it right, and making putts and pulling off shots at the right time. Harrington finished on one over. With the first major, the Masters just around the corner, it seems Tiger is coming into form just at the right time.